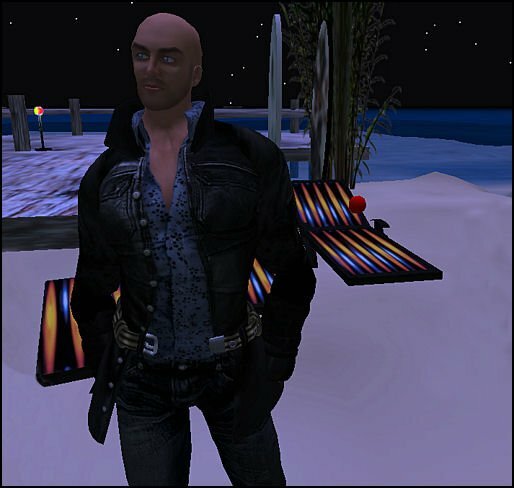 Secondlife’s Singer/Songwriter Shannon Oherlihy played an outstanding set on Dakari Isle, beachside. The stars were shining, the campfire was blazing and the air was filled with the shining lyrics that held fast to her tempting voice. Inspired by the likes of Joni Mitchell, Bob Dylan and Joan Baez, Shannon’s music is sensuous and in the moment. Shannon’s set was a mixture of covers and original songs. She brilliantly made the covers her own as they intertwined with her set, effortlessly. The lyrics to her original song, “Salvation In The Mailbox,” were radiant and the artistry used to string together the lines was brilliant. Heartfelt and personal, I enjoyed every second of her set. Milo Saintlouis caught my eye while Crowd Surfing in this great Gothicatz ensemble. Funny how a guy can name his entire outfit in two words: Gothicatz – Darkmoon. 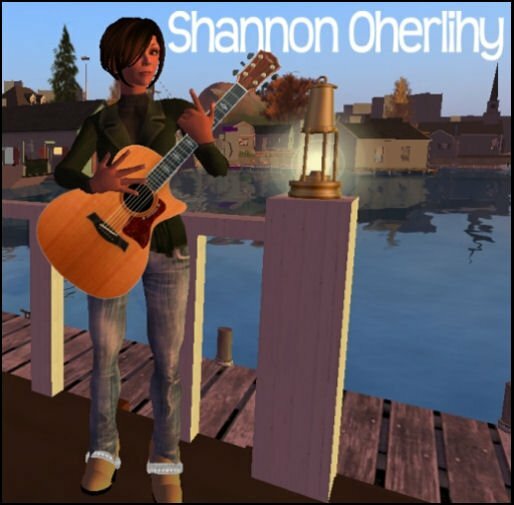 Shannon (McMahon) Oherlihy’s music is available on MySpace and cdBaby. I would suggest dropping in and checking her out live on SecondLife for the full effect. I couldn’t agree with you more about the great sounds of Shannon Oherlihy! I listen to her as much as I am able and I never get tired of listening to her beautiful voice or guitar. She is one of the best SL has to offer.. and anybody who likes folk music even just a little owes it to themselves to check her out. She has a great sound and a great personality and anybody who hears her is bound to become a fan!